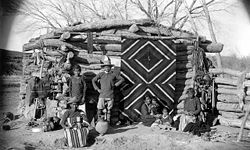 A hogan (pronounced /hoʊˈgɑːn/, from Navajo hooghan, IPA: [hoːɣan]) is traditionally the primary home of the Navajo people. It is also the center for their religious ceremonies. Other traditional Navajo structures include the summer shelter, the underground home, and the sweat house. The "male" type of hogan, modeled after the first hogan built for First Man and First Woman, is the center of religious and cultural ceremonies. The "female" type, larger and able to house a family, is a practical form of shelter during the winter. Built from simple items available in the environment (wood, stone, mud, grass) the hogan takes care of both the physical and spiritual needs of the Navajo. The Navajo word for hogan (hooghan) means "the place home"
The Navajo word hooghan means "the place home." The religious song The Blessingway describes the first hogan as being built by Coyote (a mythological character common to many Native American cultures, based on the coyote animal) with help from beavers to be a house for First Man and First Woman. Talking God gave Coyote logs and instructions on how to build the first hogan, now known as a "forked stick" or "male" hogan (ách í ádeez áhí). The poles of this first hogan are said to have been made of jewels: white shell, abalone, turquoise, and jet. After the poles were erected they were named in song: The South pole was called the pole of Mountain Woman; the West pole the pole of Water Woman; and the North pole the pole of Corn Woman. The spaces between the poles were filled with grass and earth. Then the structure was sprinkled with cornmeal by the First Man, saying "May my home be sacred and beautiful, and may the days be beautiful and plenty (O'Bryan 1993). 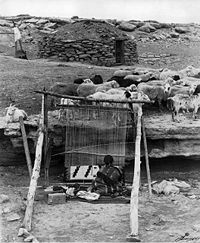 A Navajo woman sits at a loom and weaves beside her sheep with a stone and earth hogan behind. Early twentieth century. The "forked stick" or "male" hogan is used only for religious or private ceremonies. It is cone shaped with the addition of a vestibule in the front. This form of hogan is considered sacred to those who practice the Navajo religion, and is constructed in the traditional manner accompanied by ritual songs and speeches. The "circular" or "female" Hogan (tsé bee hooghan) is the family home for the Diné people and is much larger. Although more substantial, this type is not a permanent construction. The Navajo historically were semi-nomadic and used these hogans for storage and shelter during the winter. In the summer they constructed simpler summer shelters that were little more than wind-breaks with a roof, one side being completely open. The structure and arrangement of the inside of the hogan was simple and standard for every family. Although the hogan has only a single room, there is a clear division of the space such that women go to the north side (right side) and men to the south side (left side). Usually a group of four or five family hogans would be constructed close together, often housing members of the extended family. 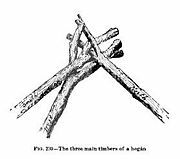 The "forked stick" or male hogan is constructed from three interlocking forked poles which form the frame, with the fourth pole leaned against them making a conical structure. The spaces between the poles are filled with soil, grass, and bark, leaving room for a smokehole and an entrance, which faces east to catch the first rays of sun at dawn. A blanket was usually hung to cover the entrance, although today a wooden door is common. The construction of this type of hogan is according to a ritual based on the story of the First Hogan. The poles are placed in position in a particular order—the south, then the west, and finally the north pole (Wyman 1970). The east pole is then placed to lean against the three interlocked poles, forming the entrance. Then two stone slabs are buried in the ground beneath the entrance. The hogan is then blessed by anointing the poles with cornmeal, moving in a clockwise direction. The female hogan resembles a pyramid with five triangular faces. Earth is used to fill the spaces between the framework logs, hiding the five faceted shape and creating thick, winter-protective walls. Large trees provide long timbers and thus substantial expansion of the interior; if only shorter logs are available different building methods are required. Logs can be piled up, curving inward, so as to form a domed roof. If trees are absent, stone is commonly used, producing a circular styled hogan (Thybony 1998). Navajos made their hogans in this fashion until the 1900s, when they started to make them in hexagonal and octagonal shapes. The change in shape may have been due to the arrival of the railroad. A supply of wooden cross-ties, which could be laid horizontally to form walls of a larger, taller home, allowed the retention of the "female" hogan shape but with more interior room. Regardless of the shape or form, the door always faces east to welcome the rising sun for good wealth and fortune. The sacred hogan is used for religious ceremonies, in particular those of "The Blessingway," a ceremony to ensure good luck, good health, and blessings for those for whom it is performed. The hogan or "place home" is the center of every blessing in life—births, weddings, good health, prosperity (increase of crops and livestock), and old age (Wyman 1970). A Hogan, a traditional dwelling of Navajo Native Americans. This hogan stands at Hubbel Trading Post National Historic Site, Ganado, Arizona. The circular hogan is the place where the family dwells. It is a place of shelter where children play, women cook and weave, and men tell stories. Children and grandchildren are taught the stories of the origin of the hogan and to respect and care for the hogan correctly and the proper placement of items within it. In this way the hogan becomes a center of strength and sound planning for life (Beck, Walters, and Francisco 1988). Because of the harmony in which the hogan is built, the family can be together to endure hardships and grow as a part of the harmony between the Sacred Mountains, under the care of 'Mother Earth' and 'Father Sky' (Griffin-Pierce 1995, 94). Many cultural taboos are associated with the hogan and its use. Should a death occur in the structure, the body is either buried in the hogan with the entry sealed to warn others away, or the deceased is extracted through a hole knocked in the north side of the structure and it is abandoned and often burned. A hogan may also become taboo for further use if lightning strikes near the structure or a bear rubs against it. Wood that was part of a hogan is never reused for any other purpose by a Navajo. Today the Navajo commonly live in trailers or small houses and rarely build new hogans as dwelling places, although some older hogans are still used as dwellings. However, hogans remain important for religious and family ceremonies and continue to be built and maintained in the traditional way for this purpose. Some tourist sites have taken to offering accommodation in hogans. For example, in Monument Valley, a region of the Colorado Plateau characterized by a cluster of vast and iconic sandstone buttes, there are Bed and Breakfast establishments where guests can sleep in a hogan built in the traditional Navajo way from juniper and ponderosa logs. These hogans have central skylights and either stone floors or the more traditional earth-packed floors. This page was last modified on 11 January 2018, at 16:47.